D100	Four-Page Dental Exam Record With Treatment Plan 11 x 17"
5Forms Business Checks & Forms > Healthcare Products > OVERSTOCK D100 Four-Page Dental Exam Record With Treatment Plan 11 x 17"
OVERSTOCK D100 Four-Page Dental Exam Record With Treatment Plan 11 x 17"
These comprehensive forms record detailed patient history and treatment plans, with a medical alert box at the top of each page for vital information. Includes tooth charts with "1-32" & "8-1/1-8" adult numbering & "a-t" & "I-V/A-E" primary lettering. Front has areas for medical/dental history & treatment planning. Keep thorough and accurate dental records! 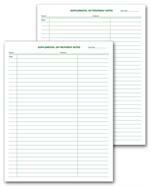 4-page record of patient history, treatment plan and account activity. 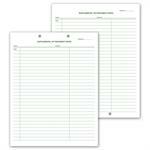 DS26 Dental Exam Record Slips Unnumbered Teeth 4 1/2 x 8"
$22.50 OVERSTOCK D100 Four-Page Dental Exam Record With Treatment Plan 11 x 17"